More and more voices are rising against the Polisario separatist group provocative incursions in the Sahara buffer zone wherein the secessionists, who are armed, funded and sheltered by Algeria, have established military installations, in a blatant violation of ceasefire agreement and UN resolutions. In Brussels, member of the European Parliament Gilles Pargneaux said the deployment of the Polisario militia in Bir Lahlou and Tifarity in the buffer zone is “an unnecessary provocation”. Their presence in this area “threatens the ceasefire that has ensured regional stability since 1991”, added chairman of the EU-Morocco friendship group. He also voiced deep concern over the situation in the Guerguerat buffer strip, saying that the Sahara issue is above all “a question of stability for the region and for Europe”. For Pargneaux, the United Nations remains the only place where a political solution can be found, calling all other international bodies to facilitate UN work, without interference or obstacles. In a message conveyed Wednesday to UN Secretary General Antonio Guterres by Morocco’s top diplomat Nasser Bourita, King Mohammed VI branded the Polisario incursions in the buffer zone as “provocative” and “unacceptable”. The royal message comes after a phone call to Guterres during which the Moroccan Sovereign expressed deep concern regarding the Polisario acts in Bir Lahlou and Tifarity. The King made it clear that such incursions represent a threat to the ceasefire agreement and violate international law and UN resolutions in addition to undermining the political process. The Monarch cited, in this regard, Algeria’s responsibility in perpetuating the Sahara conflict, which has dragged on for over four decades. In Rabat, Head of Govt Saad Eddine El Othmani renewed on Thursday Morocco’s firm stand rejecting all attempts by the Algeria-backed separatists to alter the status quo in the buffer zone, affirming that the North African Kingdom will counter and foil these hostile moves. At a news conference held Wednesday in New Yok after his meetings with UN Secretary General Antonio Guterres and President of the Security Council Peruvian Gustavo Meza-Cuadra, Moroccan foreign minister Nasser Bourita said the ceasefire implemented in 1991 is threatened by the actions of the Polisario militiamen. “Morocco will not allow a change on the ground. If the U.N., the international community, don’t take their responsibilities, Morocco will take its own responsibility”, he warned. Bourita said he shared “facts and evidence” during his meeting with Guterres, including satellite photos taken March 26 and March 29 that he said show Polisario’s construction in the buffer zone. 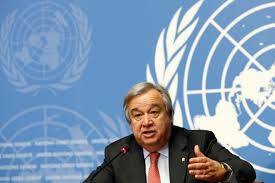 In his annual report on the Sahara submitted Wednesday to the 15 members of the Security Council, the UN Secretary General urged Algeria to “make important contributions to the political process” and to step up “its commitment to the negotiation process”. According to some analysts, such a statement shows that the United Nations understands that Algeria is an involved party in the Sahara issue and should be part of the solution as everybody knows the Algerian authorities pull the strings behind the scene in this regional conflict for geostrategic interests. Before his trip to New York, Bourita was in Washington where he met US Acting Secretary of State John Sullivan. “Acting Secretary Sullivan thanked Foreign Minister Bourita and the Moroccan people for their strong friendship and partnership with the U.S. on shared priorities, including in the global fight against ISIS,” Heather Nauert said. Later Wednesday, the State Department issued another statement reiterating that for The United States, the Morocco-proposed autonomy plan in the Sahara is “serious, credible and realistic”. Written by: Jaber Ali on April 5, 2018. Posted by Jaber Ali on Apr 5 2018. Filed under Headlines, World News. You can follow any responses to this entry through the RSS 2.0. Both comments and pings are currently closed.